You are here: Home > Blog > Flora & Fauna > Botanic Gardens, Arboreta …….. There are over 2,200 botanic gardens in 153 countries around the world and the UK's oldest is Oxford's. It is fairly small considering how many plants it contains, covering about 4.5 acres, and it feels very like the Chelsea Physic Garden in London. This may not be too surprising as they were both founded to support the practice and teaching of medicine. 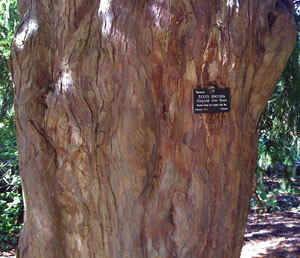 The Oxford Botanic Gardens were founded in 1621 as the Physic Garden and after only a few years the yew tree (see photo below) was planted which is still in the garden today. One of the early superintendents was Jacob Bobart (whose father, also Jacob Bobart, had been superintendent before him) and he set up an annual botanic garden seed exchange which continues today and allows various of these gardens to acquire seeds of species that they want to grow. Lewis Carrol was a great frequenter of the gardens in Oxford and they would have been an inspiration for "Alice's Adventures in Wonderland". Later, J R R Tolkien was a regular visitor to the gardens and his favourite tree, Pinus nigra (Austrian Pine) was probably the inspiration for the walking, talking tree people in "Lord of the Rings". More recently Philip Pullman in "His Dark Materials" sets a critical scene right at the end of the third trilogy on a bench in the gardens, where Lyra and Will Parry, each from a different world, agree to sit on midsummer's day to feel the presence of the other. For all these visitors the entrance would have been through (or next to) the Danby gateway which was designed in 1632/3 and is one of Oxford's earliest buildings in the baroque style, with its intricate arch, ornately decorated stonework, columns and niches for statues (see featured photo). 6,500 children now visit the Oxford Botanic Gardens each year and almost always they visit the Palm house, a greenhouse where there are exotic species and many economic plants such as cocoa, oranges, pepper, bananas and coconuts. 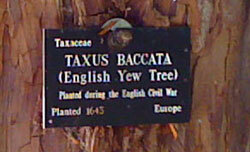 Each plant within the botanic garden collection has its own unique number and its information is stored in a botanic gardens database (BG-BASE) that is used around the world. The Oxford Botanic Gardens, like many others, operates a trainee scheme which is seriously oversubscribed: each year about 100 people apply for one of only two places to learn about botanical horticulture and arboriculture. 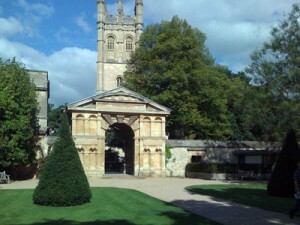 Whilst Oxford's Botanic Gardens are very centrally located, opposite Magdalen college, the Arboretum is outside the city on the road to Henley (the A4074) and only formally became part of the gardens in 1963, but it has recently been expanding with the addition of parkland in 1999 and more farmland in 2006. As well as collections of trees the arboretum has a large coppice area which is regularly coppiced and charcoal has been made from the cut rods. Part of the newly acquired Palmer's Leys is a 30 acre meadow which is being sown with imported seeds as well as seeds from the existing meadow giving a mix that includes birds foot trefoil, lady's bedstraw, lesser knapweed and ribwort plantain. Which arboretum or botanic garden would you recommend for a visit? I spent an afternoon here just sitting on one of the benches in the peace and tranquility of nature. I think that the medicinal plants are wonderful for studying and treating illnesses, but I am also a fan of the healing that peace can bring. I wish I had a garden nearby just like this one to relax in on a regular basis. I highly recommend spending time here!